If you're happy to simply download and use the 'Action' then read on. What Does The 'CRH IR Action' Do? and completes the task in the blink of an eye. Photo Filter ('Underwater' setting, a cyan tone) helps to remove any magenta cast should you have one. Black & White Filter enables tonal control of the image by adjustment of 'sliders'. 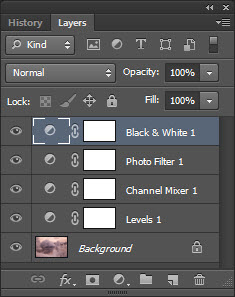 All the stages are by Adjustment Layers and therefore editable and you can switch each one off if needed. Once you have downloaded the Action you need to copy and paste it into a suitable folder. The next step is to open Photoshop. 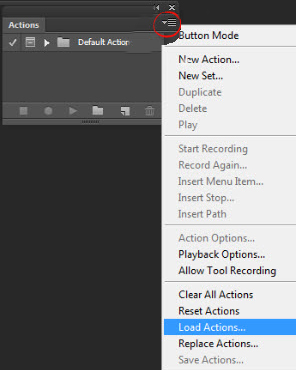 In the Action Palette click on the top right corner for the Options. Navigate to the folder where the saved Action is, open it and select the action. To run the Channel-Swap Action click on the CRH Ch Swap (action) folder downward arrow, click on 'IR Ch Swap Run', click the > arrow at the base of the Action Palette to run.